I’m Randy Martin, I'm a caricature artist. 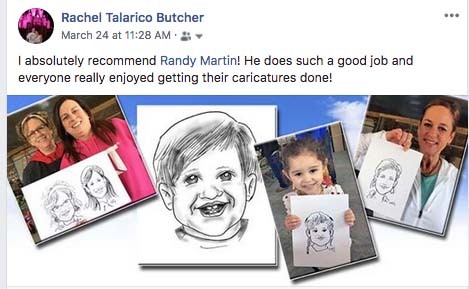 Since 1978 I’ve been drawing caricatures professionally doing festivals, Christmas parties, birthday parties, conventions, banquets, after-proms, wedding receptions & other functions. I’m easy to get along with and I enjoy making people smile with my artwork. Caricatures by Randy was great! Randy was a great addition to our all-night party! He got there early and was all set up when we arrived. We thoroughly enjoyed his work!